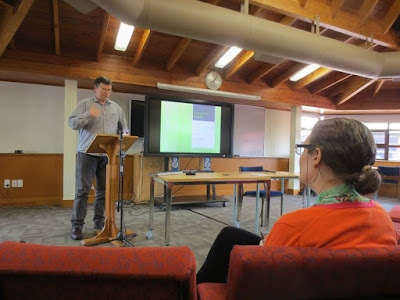 2019 - (5 March) MC'ed the launch, by Prof Chris Gallavin of Massey University, of Poetry NZ Yearbook 2019 [Issue #53] at Devonport Public Library. The invited speakers included Paul Beachman of the Devonport Library Associates, publisher Nicola Legat, the featured poet for the issue, Stephanie Christie, together with one of the prize-winners: Natalie Modrich (3rd), and poets Johanna Emeney, Alexandra Fraser, Michele Leggott, Fardowsa Mohamed, Tracey Slaughter & Bryan Walpert. 2018 - (21 & 28 November) Two lectures on New Zealand literature in the 15-week New Zealand: History & Culture course, taught by six visiting Massey University Academics: Associate Professor Kerry Taylor, Dr. Peter Meihana, Professor Peter Lineham, Dr. Gillian Skyrme, Professor Michael Roche and Dr. Jack Ross (New Zealand Centre, Peking University, Beijing, China, 19 September,2018 - 2 January, 2019). 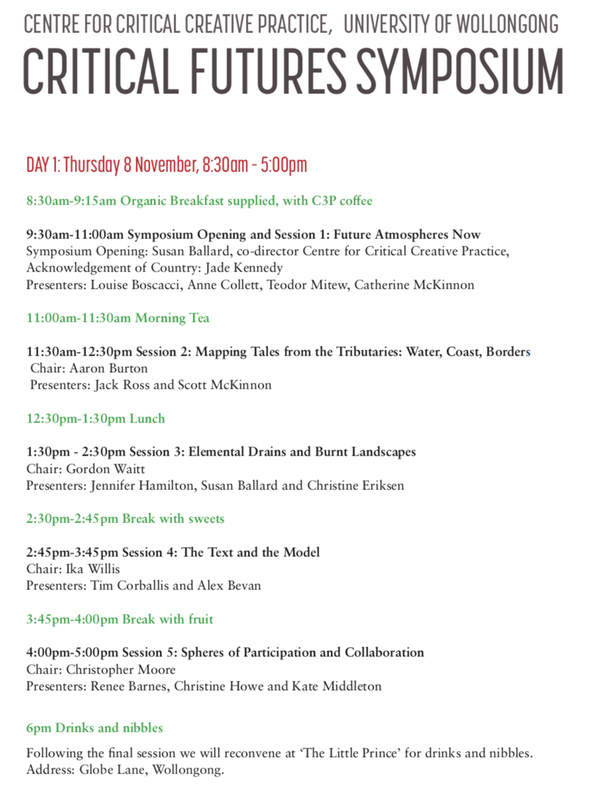 2018 - (8 November) “Natura Naturans and Natura Naturata: Three Visits to Millerton,” a paper given at the Critical Futures Symposium: Session 2: Mapping Tales from the Tributaries: Water, Coast, Borders. Chair: Aaron Burton; Presenters: Jack Ross and Scott McKinnon (Centre for Critical Creative Practice, University of Wollongong, Australia, 8-9 November 2018). 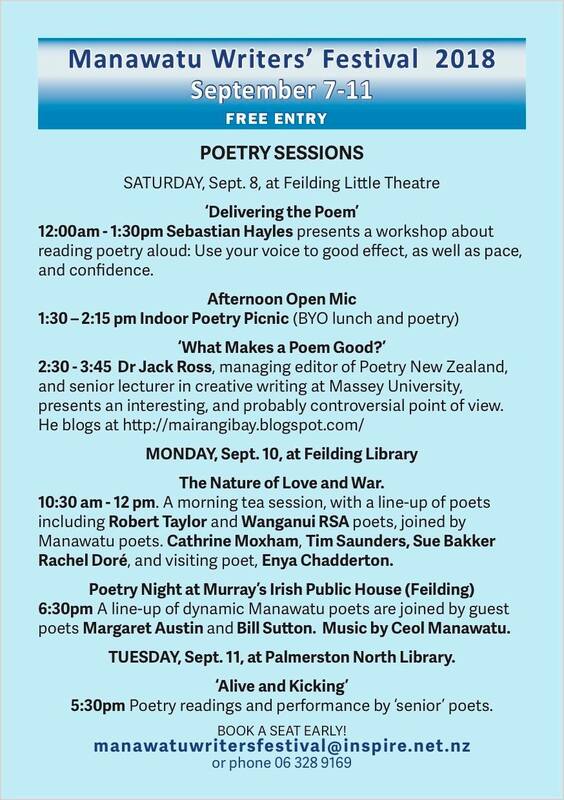 2018 - (8 September) “What Makes a Poem Good?,” a paper given in the Feilding Little Theatre as part of the Manawatu Writers' Festival 2018, Festival Co-ordinator Rachel Doré (Feilding & Palmerston North, Manawatu, 7-10 September 2018): "Is poetry so subjective that we don’t know whether it is any good. How can it be measured? 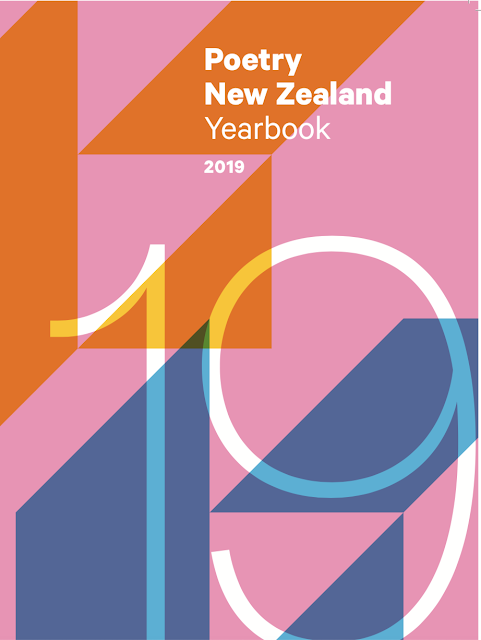 Dr Jack Ross, editor of Poetry NZ Yearbook and other poetry anthologies, will throw some light on the issue or light a fire …"
2018 - (6 September) Panellist at Auckland launch of Bonsai: Best Small Stories from Aotearoa New Zealand" (ed. Michelle Elvy, Frankie McMillan & James Norcliffe), with MC Anita Arlov, and fellow-speakers Michelle Elvy, Allan Drew & Tracey Slaughter (Jason Books, 16 O'Connell St, Auckland Central). 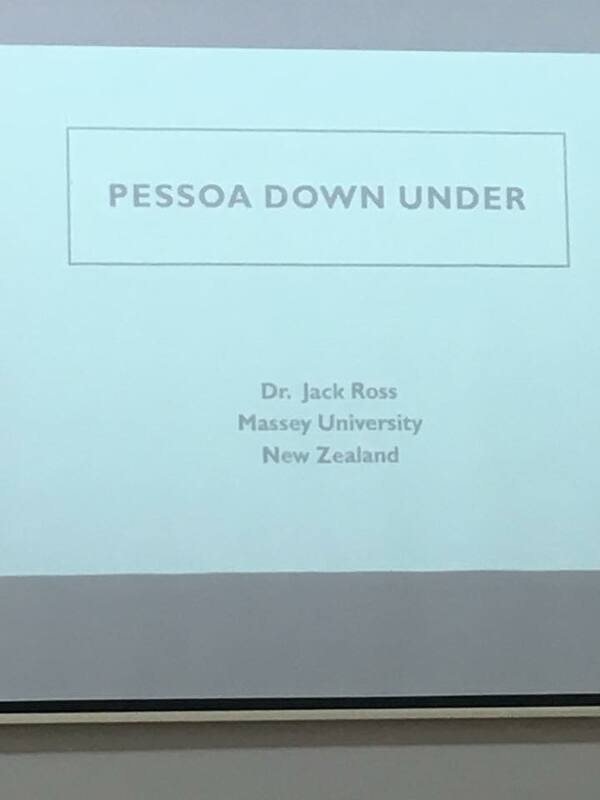 2018 - (27 June) “Pessoa Down Under,” a paper given at the 15th International Conference on the Short Story in English: “Beyond History: The Radiance of the Short Story," with moderator and co-presenter Isabel Olivieria Martins and Leandro Valentin (Universidade de Lisboa, Portugal, 27-30 June 2018). 2018 - (24 April) Guest lecture on my story "General Grant in Paeroa" to Bronwyn Lloyd's 139.280 Writing Creative Nonfiction class at Massey Albany. 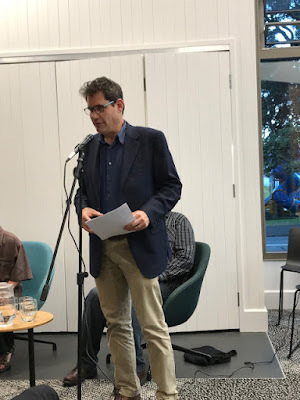 2018 - (20 March) MC'ed the launch, by A/Prof Bryan Walpert of Massey University, of Poetry NZ Yearbook 2018 [Issue #52] at Devonport Public Library. The invited speakers included Paul Beachman of the Devonport Library Associates, publisher Nicola Legat, the featured poet for the issue, Alistair Paterson, together with one of the three prize-winners: Semira Davis (2nd), and poets Iain Britton, Johanna Emeney, Callum Gentleman, Elizabeth Morton, Richard von Sturmer & Devon Webb. 2017 - (12 November) Host of "Korero - A poem is an egg with a horse inside it." 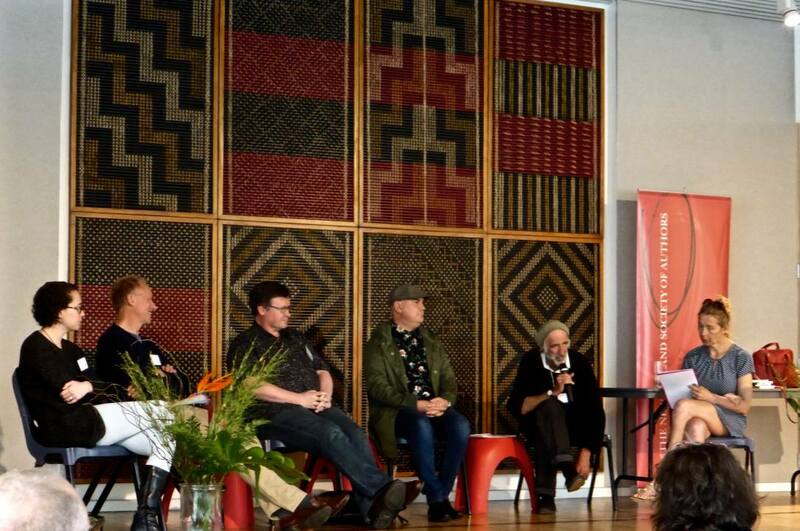 at the 3rd NZ Poetry Conference & Festival, with Poets Laureate Ian Wedde, Karl Stead, Michele Leggott & Cilla McQueen (Ellen Melville Centre, Freyberg Place, Auckland Central, 10-12 November 2017). 2017 - (11 November) Panellist in "Korero - Digital vs. Print: How do we publish and broadcast, now?" 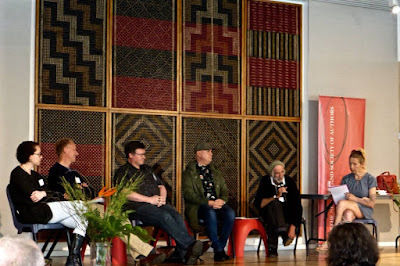 at the 3rd NZ Poetry Conference & Festival, with Host Siobhan Harvey and fellow-speakers Makyla Curtis, Sam Elworthy, Doug Poole & David Merritt (Ellen Melville Centre, Freyberg Place, Auckland Central, 10-12 November 2017). 2017 - (24 October) Launch of Vanishing Points by Michele Leggott. Chaired by Jack Ross, inaugural New Zealand Poet Laureate and Devonport local Michele Leggott will launch her new collection, Vanishing Points, at this Devonport Library Associates Event. 7–8.30pm, Tuesday 24 October 2017 - Devonport Library, 2 Victoria Road, Devonport, Auckland. 2017 - (16 October) External Academic advisor (with her two supervisors, Bryan Walpert and Ingrid Horrocks, and HOS Jenny Lawn) at Janet Newman's PhD confirmation seminar: "A Tradition of Ecopoetry in New Zealand." 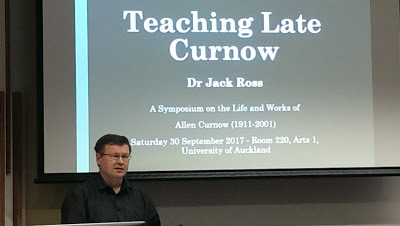 2017 - (30 September) “Teaching Late Curnow” - Paper given at A Symposium on the Life and Works of Allen Curnow, University of Auckland, Arts 1: Room 220, coinciding with the publication of a new edition of his Collected Poems and Terry Sturm's biography Simply by Sailing in a New Direction (both AUP). 2017 - (27 September) With A/Prof Grant Duncan, MC'ed a reading and presentation by poet Jan Kemp on her new dual-text translated books Dante Down Under and Il cielo di Dante, as part of the Social & Cultural Studies Seminar series (4 pm, Albany Atrium Staff Lounge, AT3.50, Massey University). 2017 - (3 September) MC'ed a reading and presentation by poets Graham Lindsay and Michele Leggott at Massey University's Albany campus, as part of the contact workshop for 139.750: Contemporary New Zealand Writers in an International Context. 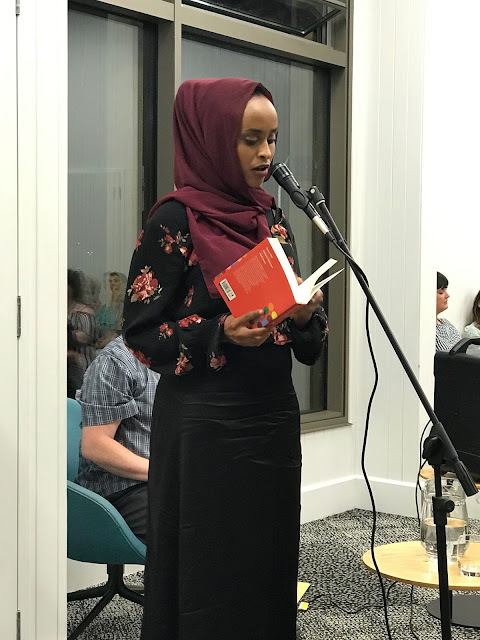 2017 - (23 August) Launched Stu Bagby's new book Pockets of Warmth, an occasion MC'ed by Helen Woodhouse, with additional speaker Stephanie Johnson, at Takapuna Public Library. 2017 - (6 July) Judged a Creative Writing and a Song-writing competition, and taught a Creative Writing workshop on Ekphrasis at the Create1World 2017 Creative activism competition and conference, organised by our College External Relations and Development Account Manager Nicole Canning, and MC'ed by Ryan Allen, in the Sir Neil Waters Building, Albany Campus, Massey University. 2017 - (17 May) “Ashvegas 1881: The Great Romance, by 'The Inhabitant'” - Social & Cultural Studies Seminar series (4 pm, Albany Atrium Staff Lounge, AT3.50, Massey University). 2017 - (14 March) MC'ed the launch, by Prof Michele Leggott of Auckland University, of Poetry NZ Yearbook 2017 [Issue #51] at Devonport Public Library. The invited speakers included publisher Nicola Legat, Jan Mason of the Devonport Library Associates, the featured poet for the issue, Elizabeth Morton, together with two of the three prize-winners Emma Shi (1st) and Devon Webb (2nd), and poets Stu Bagby, Johanna Emeney, Emma Harris, Kiri Piahana-Wong & Lisa Samuels. 2016 - (6 October) Guest lecture on my essay "On the Road to Nowhere: Revisiting Samuel Butler's Erewhon" to Tracey Slaughter's ENGL314 Creative Nonfiction class at the University of Waikato. 2016 - (15 September) "What should a magazine called Poetry NZ look like?," a paper given at Poetry on the Move: Poetry Adventures on and off the page, with fellow presenters Lucy Dougan, Jeanine Leane & Jen Webb (A two-week festival of poetry, organised by the International Poetry Studies Institute (IPSI) in the Faculty of Arts and Design at the University of Canberra, 6-16 September 2016). 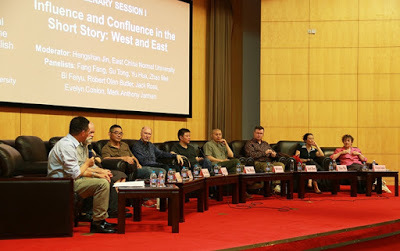 2016 - (15 July) MC'ed Reading 8F, with writers Allan Weiss, Bi Feiyu & Rebekah Clarkson, at the 14th International Conference on the Short Story in English: “Influence and Confluence in the Short Story: East and West" (East China Normal University, Shanghai, China, 13-16 July 2016). 2016 - (14 July) Chaired session 5A: on the work of Alice Munro, at the 14th International Conference on the Short Story in English: “Influence and Confluence in the Short Story: East and West," with presenters Yonghua Mu, Zhang Qiong & Wen-Shan Shieh (East China Normal University, Shanghai, China, 13-16 July 2016). 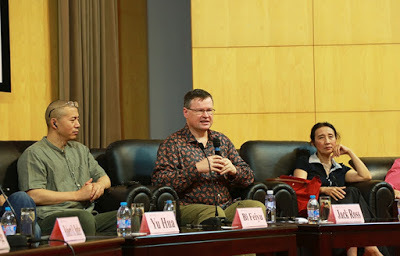 2016 - (14 July) “Settler & Speculative Fiction in the NZ Short Story; Or: The Strange Half-life of Anthologies,” a paper given at the 14th International Conference on the Short Story in English: “Influence and Confluence in the Short Story: East and West," with moderator Jay Ruud and co-presenters Yan Shen & Kairui Fang (East China Normal University, Shanghai, China, 13-16 July 2016). 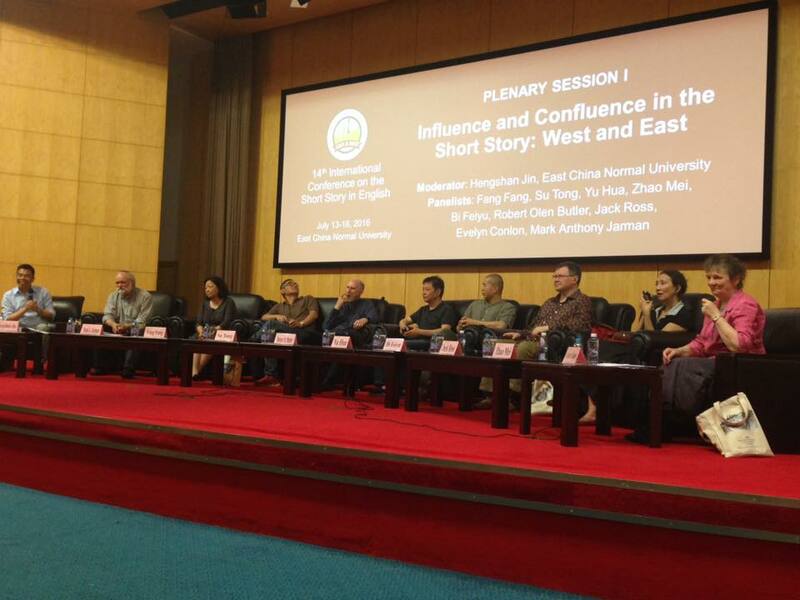 2016 - (13 July) Member of Plenary Panel on "Influence and Confluence in the Short Story: East and West" at the 14th International Conference on the Short Story in English, with Dr. Henshang Jin (chair) and fellow-panellists Mark Anthony Jarman, Fang Fang, Su Tong, Robert Olen Butler, Yu Hua, Bi Feiyu, Zhao Mei and Evelyn Conlon (East China Normal University, Shanghai, China, 13-16 July 2016). 2016 - (13 July) Member of Panel on "‘The V word’ – Voice in the New Zealand Short Story" at the 14th International Conference on the Short Story in English: “Influence and Confluence in the Short Story: East and West," with Tracey Slaughter (chair) and fellow-panellists Bronwyn Lloyd, Frankie McMillan and Leanne Radojkovich (East China Normal University, Shanghai, China, 13-16 July 2016). 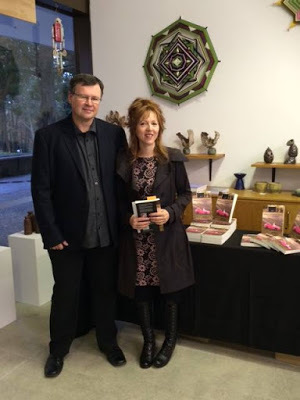 2016 - (26 May) Launched Tracey Slaughter's new book deleted scenes for lovers, an occasion MC'ed by Mark Houlahan, with speakers Catherine Chidgey and Fergus Barrowman, at at the Art Fusion Gallery, Waikato University. 2016 - (16 March-10 June) External Academic Reviewer for the Graduating Year Review for the Writing Studies Programme offered in the School of Arts at the University of Waikato. 2015 - (21 October) MC'ed Lounge 47 reading (nzepc in association with Poetry NZ), with Stu Bagby, Peter Bland, Roger Horrocks, Sophia Johnson, Michele Leggott, Bronwyn Lloyd, Vana Manasiadis, Elizabeth Morton, Lisa Samuels and Robert Sullivan, on Wednesday 21 October at Old Government House, University of Auckland City Campus, corner of Princes St and Waterloo Quadrant (5.30-7.00 pm). 2015 - (27 August) Hamilton Book Month Poetry Workshop - 1 pm, Wintec, Hamilton. 2015 - (5 June) “Anno Domini 2000; or, Woman's Destiny: Sir Julius Vogel's Fantasies of Gender and Race” – with Dr Ingrid Horrocks: "Unsettling Imaginaries: Exploring Place in Essays by Geoff Park, Steve Braunias, and Lynn Jenner": SEMS / School of Humanities Staff Research Seminar series - 4 pm, Albany / Wellington / Palmerston North VLT rooms, Massey University. 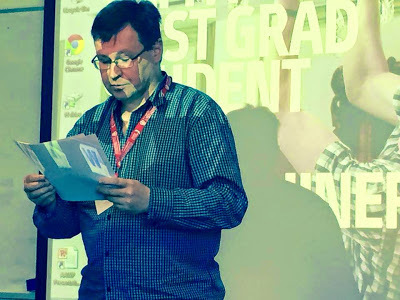 2015 - (20 May) MC'ed the Massey Albany School of English & Media Studies Arts Out Loud 'From Page to Screen' Session - presented by Dr Matthew Harris - in the Albany Theatre Lab. 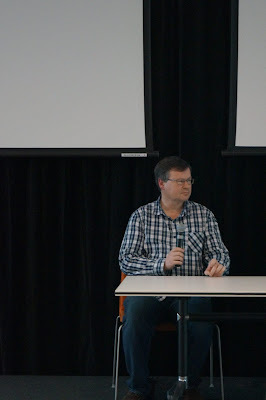 2015 - (17 April) Chaired the Massey University School of English & Media Studies Off the Page Short Fiction Panel - with Owen Marshall, Jaspreet Singh and Tracey Slaughter - at the Palmerston North City Library. 2014 - (3 December) Made a presentation at the Placing the Personal Essay Colloquium on Essaying Place: with Ashleigh Young (chair) and fellow-panellists Lynn Jenner, Harry Ricketts and Giovanni Tiso (School of English & Media Studies, Massey University, Wellington, 2-3 December 2014). 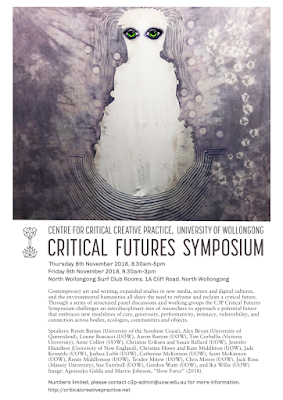 2014 - (2 December) “Is it Infrareal or is it Memorex?,” a paper given at the Australasian Association of Writing Programmes Conference (College of Humanities & Social Sciences, Massey University, Wellington, 30 November-2 December 2014). 2014 - (1 December) MC'ed the Australasian Association of Writing Programmes launch, by Dr Ingrid Horrocks of Massey University, of the Poetry NZ Yearbook 1: the readers included: Jake Arthur, Paul Hetherington, Ingrid Horrocks, Thérèse Lloyd, Janet Newman, Karina Quinn, and Liang Yujing, at Meow Café, 9 Edward Street, Wellington. 2014 - (30 November) Chaired session B4 at the 19th Annual Australasian Association of Writing Programmes Conference on Genre Matters: Straddling and Flashing, with presenters Eugen Bacon, Sif Dal, Lisa Smithies, and Sherryl Clark (The Pit, Te Ara Hihiko, Wellington Campus, Massey University). 2014 - (28 November) Member of final Round-table discussion, concluding remarks in the Truth or Beauty: Poetry and Biography Conference: with Helen Rickerby (chair) and fellow-panellists Anna Jackson, Saradha Koirala and Chris Tse (Victoria University of Wellington, 26-28 November 2014). Poetry New Zealand originated in 1951 and has continued under a range of editors. 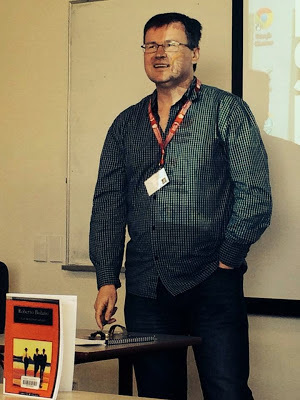 From this year it is now edited and published by Massey's College of Humanities and Social Sciences - under creative writing lecturer, Jack Ross. 2014 - (31 October) MC'ed the launch, by A/Prof Grant Duncan of the College of Humanities and Social Sciences, of Poetry NZ Yearbook 1 [Issue #49] in the Theatre Lab at Massey University's Auckland Campus. The invited speakers included the featured poet for the issue, Lisa Samuels, together with Iain Britton, Michele Leggott, Elizabeth Morton, Alistair Paterson, Richard von Sturmer & Kirsten Warner. 2014 - (6 August) Led a discussion on the topic: "Does Art really have anything useful to say when Atrocity comes calling?" in Aiden Hatley's Massey Academic Discussions series at Massey Albany. The Poetry New Zealand journal has had to adapt to survive more than most in its fifty year history. And with the appointment of Massey University lecturer and writer Jack Ross as its new managing editor, more changes are planned. But Jack tells Justin Gregory that his changes should feel more like renewal rather than reinvention. 2014 - (29 May) Taught a workshop on "How to construct a verse drama" in Gus Simonovic's Page2Stage Course at TAPAC, Western Springs. 2014 - (21 May) Taught a haiku workshop in the Introduction to Creative Writing Course at John Cranna's Creative Hub (Waterfront Room, Auckland Harbour). 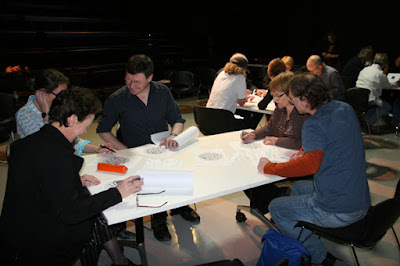 2014 - (1 April) Taught a poetry workshop on ekphrasis in the Introduction to Creative Writing Course at John Cranna's Creative Hub (Waterfront Room, Auckland Harbour). 2014 - (14 February) Chaired Michele Leggott's Keynote Address "Professing Creativity: A Family Story" at the Professing Creativity Conference at Massey's Wellington Campus. 2013 - (10 December) Taught a poetry workshop on ekphrasis in the Introduction to Creative Writing Course at John Cranna's Creative Hub (Waterfront Room, Auckland Harbour). 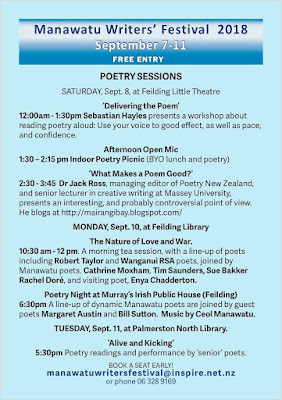 2013 - (2 November) Panel Member in Hawke's Bay Poetry Conference Session on Form and Content in Contemporary Poetry: with Janet Newman (chair) and panellists Niel Wright, Ben Fagan, Mary-Jane Duffy and Gail Romano (Havelock North Community Centre, Hawke's Bay, 1-3 November). 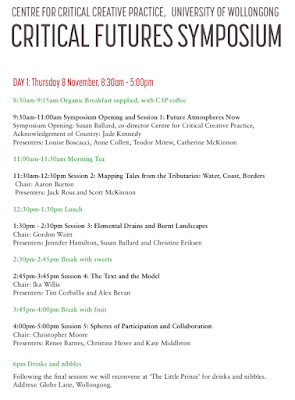 2013 - (2 October) “The Poetics of the Denniston Plateau”: College of Humanities and Social Sciences Seminar – 4 pm, Atrium Common Room, Massey University. 2013 - (27 September) Chaired a session at the Poetry as Social Action Symposium (Pat Hanan Room, Arts 2, Auckland University), with poets Ali Alizadeh and Jen Crawford. 2013 - (7 August) Organised and MC'ed poet, graphic novelist and anthologist Robert Sullivan's talk / reading in the Massey University Writers Read series (Albany Campus). 2013 - (17 June) “Airlifting Paul Celan,” a paper given at the Transcultural Imaginaries: Making New, Making Strange Conference (School of Humanities & Social Sciences, Nanyang Technological University, Singapore, 14-17 June 2013). 2013 - (1 May) Organised award-winning short-story writer Sue Orr's talk / reading - MC'ed by Bronwyn Lloyd - in the Massey University Writers Read series (Albany Campus). 2013 - (27 March) Organised and MC'ed award-winning poet, novelist and literary critic C. K. Stead's talk / reading in the Massey University Writers Read series (Albany Campus). 2012 - (25 September) Member of the MIT Monitoring Panel, asessing the BA: Creative Writing course administered by Robert Sullivan of the Faculty of Creative Arts. 2012 - (13 September) Organised and MC'ed award-winning poet, anthologist and children's author Paula Green's talk / reading in the Massey University Writers Read series (Albany Campus). 2012 - (22 August) “Translating Paul Celan”: College of Humanities and Social Sciences Seminar – 4 pm, Atrium Common Room, Massey University. 2012 - (9 August) Organised and MC'ed poet and District and Family Court Judge John Adam's talk / reading in the Massey University Writers Read series (Albany Campus). 2012 - (30 May) Member of the AUT Graduating Year Review Panel, chaired by Dr Paul Wells (Senior Lecturer, Faculty of Business), for the Master of Creative Writing and BA: Creative Writing. 2012 - (2 May) Organised and MC'ed bestselling author Jeffrey Moussaieff Masson's talk / reading in the Massey University Writers Read series (Albany Campus). 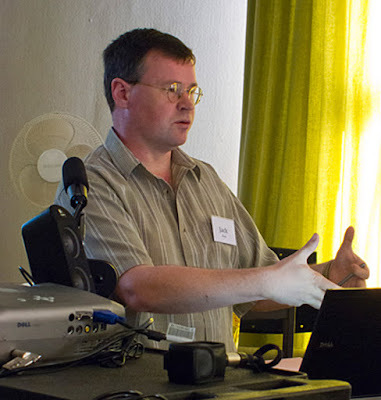 2012 - (30 March) “Digitising Leicester Kyle: The Dilemmas of a Literary Executor,” a paper given at the Short Takes on Long Poems Symposium (University of Auckland, 29-30 March). 2011 - (28 November) MC at Titus Books launch of Bronwyn Lloyd’s The Second Location and Scott Hamilton's Feeding the Gods at Objectspace, Ponsonby. 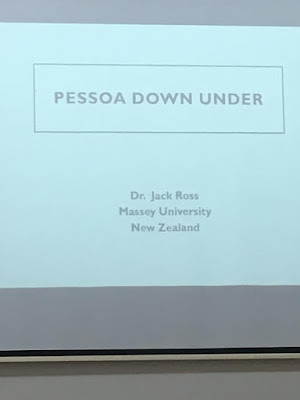 2011 - (12 November) "Jack Ross, PhD, lecturer in English at Massey University, will be the guest speaker at the Rose Centre in Belmont on November 12 at 2 pm. His appearance completes a decade of hosting New Zealand top authors and poets by the Rose Centre Writers. 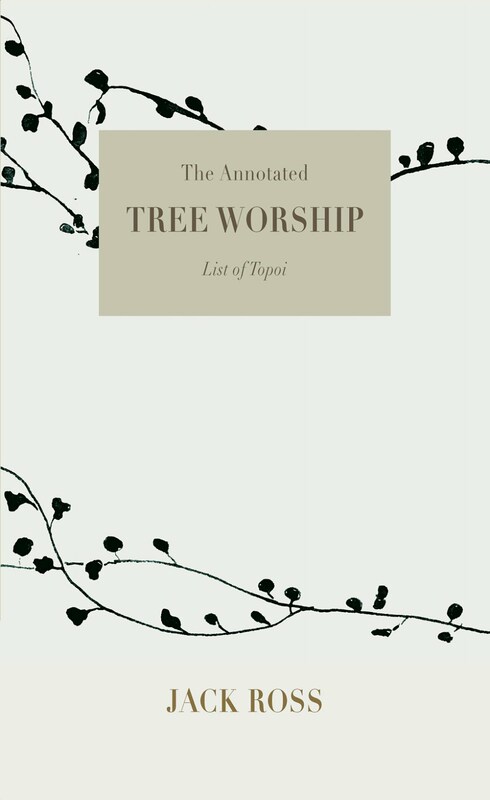 Dr Ross will be speaking on the life and work of Leicester Kyle, eco-poet, botanist and environmentalist and retired Anglican priest who was well-known in Auckland before his death on the West Coast in 2006. Join the Rose Centre Writers and enjoy the talk and a cup of tea afterwards for $5. Contact Hazel at 489-7203 or email hazelroff@gmail.co.nz." North Shore Times Advertiser (1 November, 2011): 5. 2011 - (24 September) A discussion of the Gothic as a recurring theme in contemporary New Zealand film, literature and art with Dr Jenny Lawn and Dr Jack Ross, as part of the public programme for Lugosi's Children, curated by Bronwyn Lloyd (Objectspace, 8 Ponsonby Road, Auckland 1032). 2011 - (11 May) Organised and MC'ed Poet Laureate Ian Wedde's talk / reading in the Massey University Writers Read series (Albany Campus). 2011 - (12 July) “The Twenty-Year Masterclass: Paul Celan’s correspondence with Gisèle Celan-Lestrange,” a paper given at the Literature and Translation Conference (Melbourne: Monash University, Caulfield Campus, 11-12 July). 2011 - (8 July) “A brief Poetics,” a paper given at the Poetry & the Contemporary Symposium (Melbourne: Deakin University, 7-10 July). 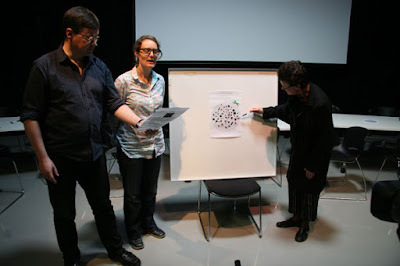 2011 - (8 July) Chaired a roundtable session on “The Poetics of Unimprovement,” with Australian poets Jill Jones, Claire Gaskin and Bonny Cassidy, at the Poetry & the Contemporary Symposium (Melbourne: Deakin University, 7-10 July). 2011 - (11 May) Organised and MC'ed award-winning writer Anne Kennedy's talk / reading in the Massey University Writers Read series (Albany Campus). 2010 - (13 November) "A Short History of Fairytales": Lecture at One Brown Box: A storybook exhibition for children by Bronwyn Lloyd and Karl Chitham (Objectspace, 8 Ponsonby Road, Auckland 1032). 2010 - (17 October) Launched the ESAW [Earl of Seacliff Art Workshop] publication of Raewyn Alexander’s A Bee Lover's Poetry Companion at Ivanhoe Road, Western Springs. 2010 - (1 October) Creative Writing Courses Panel (1 of 3): Paul Mountfort, head of AUT's creative writing centre; Brian Morris, principal of the NZ Institute of Business Studies, which offers a variety of correspondence courses in creative writing; and Jack Ross, of Massey University's English Department, who is introducing Massey's new Master of Creative Writing programme, at NZSA Auckland Branch Meeting (Venue: The Pat Hanam room on the first floor of Auckland University's school of Media, Film and Television studies). 2010 - (11 September) "Which way please? 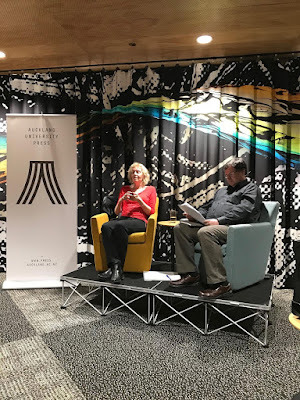 ": Discussion with Paula Green about ways into New Zealand poetry, to coincide with the publication of 99 Ways into NZ Poetry, by Paula Green & Harry Ricketts, at the Going West Books and Writers Weekend (War Memorial Hall, Titirangi). 2010 - (7 September) Guest Lecture on Seamus Heaney and W. B. Yeats to Year 12 students at Kristin School, Albany. 2010 - (2 September) Panel Member in Home & Away Plenary Session, with Pam Brown (MC), Michael Farrell, Michele Leggott, and Ann Vickery (Sydney, UTS Broadway Campus). 2010 - (1 September) Presenting new work in a panel with Jen Crawford, Martin Harrison, and Amanda Stewart at Home & Away: Trans Tasman Poetry Symposium (Sydney, UTS Broadway Campus). 2010 - (3 June) Guest Lecturer on "Creative Writing and Modernism" at the College of Humanities Humanities Experience Day for Year 13 High School Students (Albany Campus, Massey). 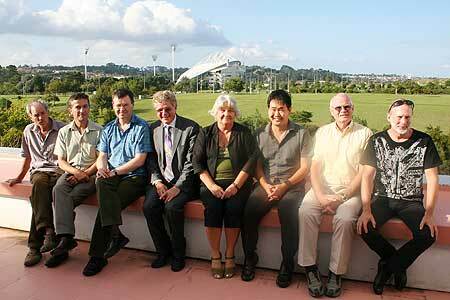 2010 - (19 May) “NZSF”: School of Social and Cultural Studies Staff Seminar – 4 pm, Atrium Common Room, Massey University. 2010 - (18 May) "Theme & Variations:" Poetry Exercise with Michele Leggott & Helen Sword’s Stage 3 Poetry off the Page students at Auckland University. 2010 - (21 March) Took a Haiku session in the Michael King Young Writers Workshop series, organized by Jo Emeney, at the Devonport Public Library. 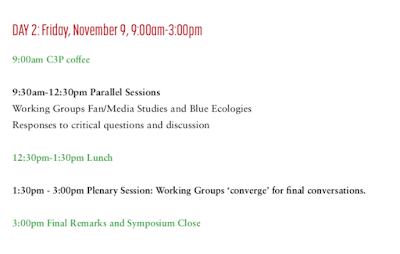 2009 - (3 December) Flying Blind: A Panel Presentation on the cultural and artistic impact of new media technologies. with writer Jack Ross, filmmaker Gabriel White,filmmaker David Blyth & Film Archive curator Amelia Harris (Auckland Film Archive, Level 1, 300 K Rd). 2009 - (29 June) Host of Writers on Monday session on "Multimedia and the Word", featuring Helen Sword & Gabriel White (New Auckland Art Gallery Lounge, corner of Lorne St & Wellesley St). 2009 - (26 June) Member of the AUT Graduating Year Review Panel, chaired by Peter Gilderdale (HOD: Graphic Design), for the BA: English Studies. 2009 - (25 June) Guest Lecturer at the College of Humanities Humanities Experience Day for Year 13 High School Students (Albany Campus, Massey). 2009 - (19 May) Speaker, with Prof Paul Spoonley, Andrew Chrystall, Joe Grixti, Ainsley O’Connell, A/Prof Peter Lineham, Grayson Coutts & Joanne Landeg, at the Communications Evening for Parents and High School Students (Albany Campus, Massey). 2009 - (21 April) "The Dada Lady of the Sonnets:" Multimedia presentation to Michele Leggott’s Poetry off the Page students at Auckland University, with Tim Page and Helen Sword. 2008 - (21 July to 23 October) "ENG 220 / 356: Novels since 1900." A Course of 24 lectures. English Department. Auckland University. 2008 - (4 June) Tracey Slaughter launches Rowan McCormick’s Writers of Passage, Social and Cultural Studies Monograph series 9, along with Home & Away: Life Writing 3, an anthology edited by Kathryn Lee and Jack Ross (Massey University: SSCS) in the Third Floor Common Room, Atrium Building, Massey Albany. 2008 - (28 May) “What are we teaching when we say we teach creative Writing?” School of Social and Cultural Studies Staff Seminar – 4 pm, Atrium Common Room, Massey University. 2008 - (20 May) Reading and presentation to Michele Leggott’s Poetry off the Page students at Auckland University, with Brian Flaherty and Paula Green. 2007 - (1 August) “Presenting – NZ Poets in Performance.” Public Lecture in Chancellor’s Series in the Staff Common Room of the Study Centre, Massey University, Albany. 2007 - (30 March) Outside Academic representative on an AUT internal panel considering AUT’s proposed new Major in Creative Writing (presented by Dr Paul Mountfort), and Masters in Creative Writing (presented by John Cranna). 2006 - (2 December) Launched Gabriel White’s new film Aucklantis (preceded by a short film by Ben Holmes), in lecture theatre WE240, AUT, at the AUT open day. 2006 - (14 October) “Classic NZ Poets in Performance.” Talk at North Shore Writers’ Group in the Belmont Rose Centre. 2006 - (22 October) Interviewed by Lynn Freeman, with Tina Shaw, for Radio New Zealand’s Arts on Sunday about the Myth of the 21st Century: An Anthology of New Fiction, Reed. 2006 - (22 August) Interviewed by Ling-Ling Liang, with Xiaoping Wang and Mary Paul, for World TV Limited (Sky Channel 10) about the Massey Life Writing course. 2006 - (16 August) “Classic NZ Poets in Performance.” Slightly Foxed Bibliographical Society, Kinder House. 2006 - (23 July) 11.15 am: Interview with Timothy Giles on Radio Pacific about Classic New Zealand Poets in Performance, edited by Jack Ross & Jan Kemp, published by AUP. 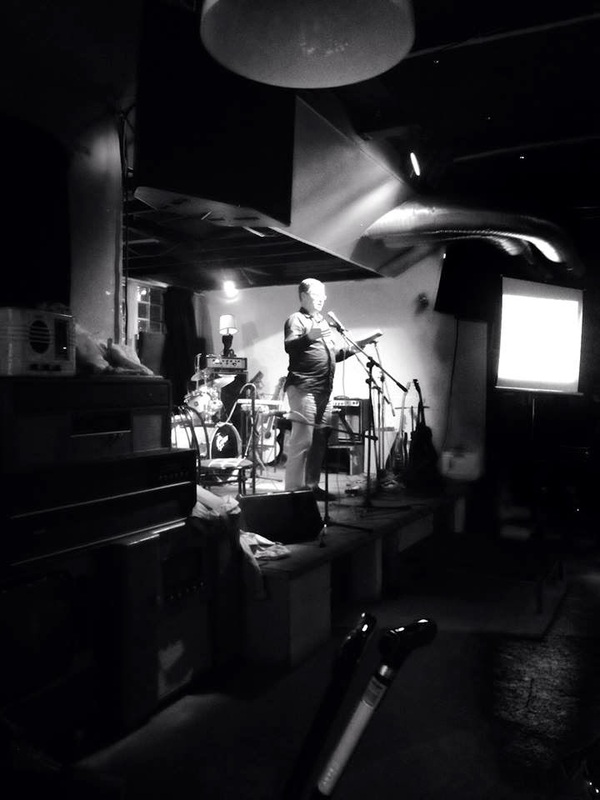 Three poems were played: “Camping,” by Fleur Adcock, “Green turtle,” by Michael Jackson & “The Spark’s Farewell to its Clay,” by R. A. K. Mason. 2006 - (22-23 April) Writing Workshop: Words & Places (Bluff: Te Rau Aroha Marae) & New in 06: discussion of The Imaginary Museum of Atlantis at the Bluff 06 Poetry Symposium, organised by David Howard, Michele Leggott, Cilla McQueen & Brian Flaherty. 2005 - (5 December) Launched HeadworX publication of Richard von Sturmer’s Suchness: Zen Poetry and Prose (with music by Don McGlashan) at the St Columba Centre, 40 Vermont Street, Ponsonby. 2005 - (16 November) Mary Paul and Grant Duncan launch Where Will Massey Take You? Life Writing 2, an anthology edited by Jack Ross (Massey University: School of Social and Cultural Studies) in the Third Floor Common Room, Atrium Building, Massey @ Albany. 2005 - (20 October) co-MC with Ahmed Esau, introducing Riemke Ensing, Deborah Manning, and Bill Manhire, at the launch of Ahmed Zaoui’s Migrant Birds: 24 Contemplations, at the Crypt of St. Benedict’s Church, Newton. 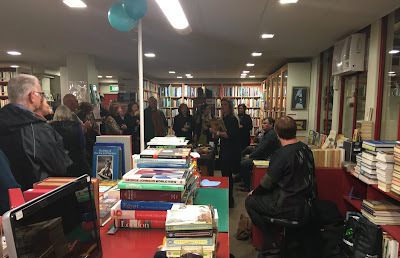 2005 - (17 October) Launched Titus Books’ publication of William Direen’s New Sea Land and Stephen Oliver’s Either Side The Horizon (together with Alistair Paterson, launching Olivia Macassey’s Love in the Age of Mechanical Reproduction) at Rakino’s, High Street, Auckland. 2005 - (30 July) Co-chair, with Wensley Willcox, of meeting of North Shore Branch of Society of Authors / P.E.N. : William Taylor as guest – Massey @ Albany (Atrium Common-room). 2005 - (18 June) Chaired meeting of North Shore Branch of Society of Authors / P.E.N. 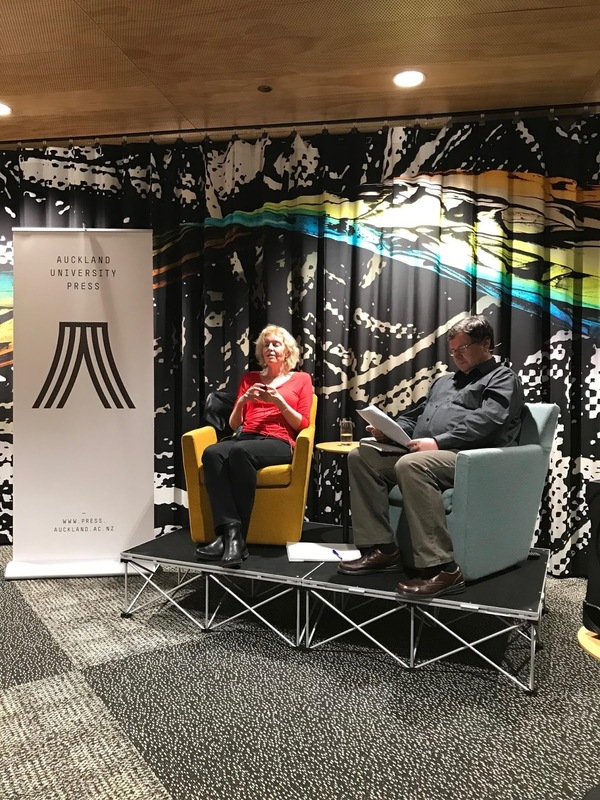 : Michele Leggott reading from Milk & Honey – Michael King Writers’ centre, Mt Victoria, Devonport. 2005 - (9 June) “The Golem of Prague.” Paper presented at the Massey (Albany) School of Social and Cultural Studies Research Day, Vaughan Park Anglican Retreat, 1043 Beach Rd, Long Bay. 2005 - (18 May) One of three judges at International Festival Day Stalls Competition, Massey University, Albany. 2004 - (11 September) Talk and translation workshop at North Shore Writers’ Group in the Belmont Rose Centre. 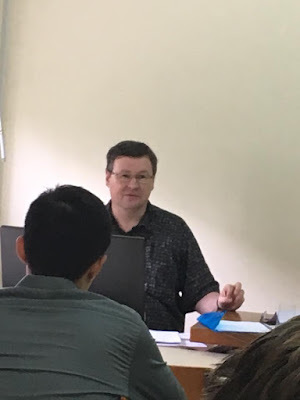 2004 - (10 June) “Kendrick Smithyman in Italian.” Paper presented at the Massey (Albany) School of Social and Cultural Studies Research Day, Vaughan Park Anglican Retreat, 1043 Beach Rd, Long Bay. 2004 - (19 May) “Life and times of Janet Frame.” Slightly Foxed Bibliographical Society, Kinder House. 2003 - (26 July) Massey @ Albany – Inaugural North Shore Society of Authors / P.E.N. 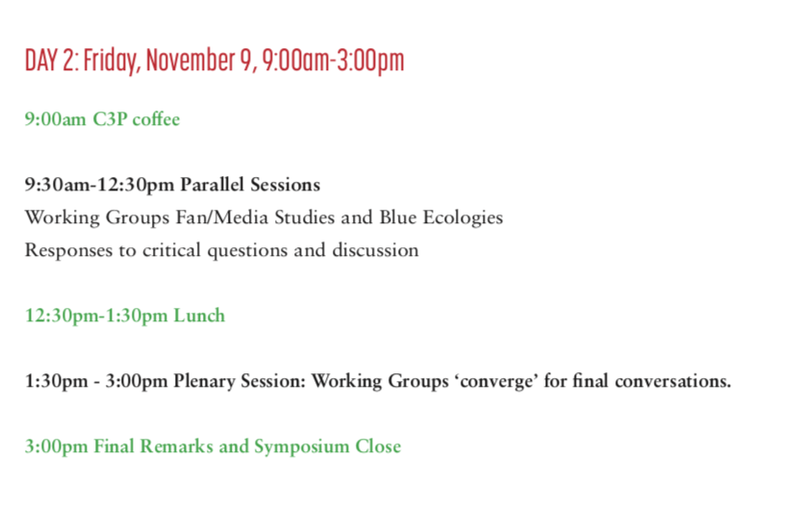 meeting: co-chaired with Wensley Willcox. 2003 - (26 July) Massey @ Albany – 139.789 Special Topic Creative Writing: Two-hour poetry workshop. 2003 - (19 July) "Meeting Paul Celan.” A paper read at The Poetics of Exile: An International Conference. Auckland University. 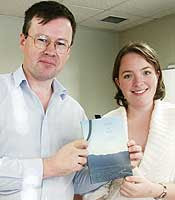 2003 - (4 June) Tina Shaw and Mike O’Brien launch [your name here]: Life Writing, an anthology edited by Jack Ross (Massey University: School of Social and Cultural Studies) in the Third Floor Common Room, Atrium Building, Massey @ Albany. 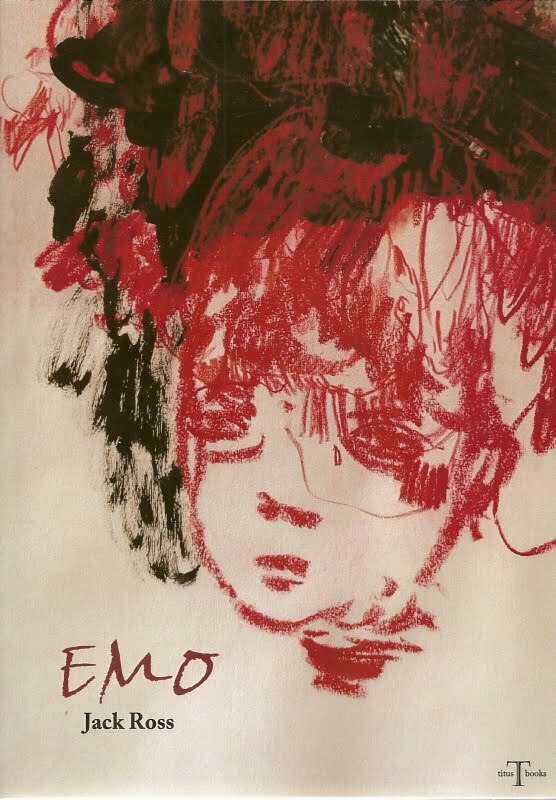 2003 - (March–October) Massey @ Albany – 139.789 Special Topic Creative Writing, taught by Mary Paul: Chantal’s Book included as one of three prescribed poetry texts. 2003 - (8 March) Talk and workshop at North Shore Writers’ Group in the Belmont Rose Centre. 2002 - (24 April) “Shakespeare.” Slightly Foxed Bibliographical Society, Kinder House. 2001 - (19 September) “Edgar Allan Poe.” Slightly Foxed Bibliographical Society, Kinder House. 2001 - (21 March) “Antarctica.” Slightly Foxed Bibliographical Society, Kinder House. 2000 - (21 July) Organised the book-launch of Leicester Kyle’s A Safe House for a Man (Auckland: Polygraphia Press) at the Takapuna Public Library. 2000 - (19 July) “Henry James.” Slightly Foxed Bibliographical Society, Kinder House. 1999 - (24 September) “On the Spot: Avant-garde Poetry in New Zealand.” English Department Seminar. Massey University at Albany. 1999 - (1 September) “Mikhail Lermontov,” with Bruce Grenville. Slightly Foxed Bibliographical Society, Kinder House. 1998 -(10 June) “Maxim Gorky,” with Bruce Grenville. Slightly Foxed Bibliographical Society, Kinder House. 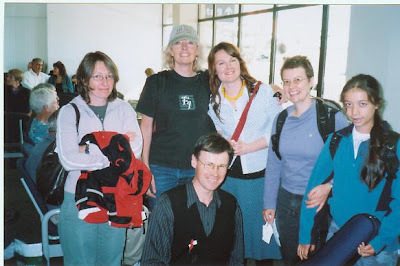 1998 - (29 March) Translation Workshop at the Trustpower “Into the Light” Poetry Festival (Tauranga). 1998 - (18 March) “Kendrick Smithyman.” Slightly Foxed Bibliographical Society, Kinder House. 1997 - (24 September) “The Thousand and One Nights.” Slightly Foxed Bibliographical Society, Kinder House. 1996 - (February to March) “East Meets West – The Lesson of the Thousand and One Nights: A Course of 6 lectures.” Continuing Education Department. Auckland University. 1995 - (22 October) “A Cautionary Tale - Translating Ezra Pound’s Italian Cantos.” New Zealand Society of Translators and Interpreters Annual Conference. Auckland Institute of Technology. 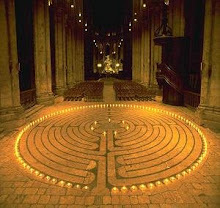 1994 - (9 June) “Barth, Borges and the Poetics of Stasis in The Thousand and One Nights.” STASIS Conference. Auckland University. 1994 - (February to March) “SF – The Way the Future Was: A Course of 10 lectures.” Continuing Education Department. Auckland University. 1994 - (7 Feb) “Voyage en Orient – The Victorian Traveller and the Arabian Nights.” 16th Australasian Victorian Studies Conference. La Trobe University. 1994 - (2 Feb) “Europe, Christianity and the Crusades in The Thousand and One Nights.” ANZMRS – Joint Conference – AHMEME. University of Tasmania. 1993 - (10 Feb) "Cunninghame Graham’s Brazil: Differing Interpretations of the Canudos Campaign, 1896-97.” 14th Australasian Victorian Studies Association Conference. Auckland University. 1992 - (2 Feb) “Parodies of the Arabian Nights in English.” English Section. 27th Australasian Universities Language & Literature Association Congress. Otago University. 1992 - (16 April) “Malory and Scheherazade: A Study in Narrative Method.” Department of English Staff Seminar. Auckland University. 1991 - (25 July) “Pound’s Italian Cantos: Problems of Structure and Translation.” Department of English Staff Seminar. Massey University. 1990 - (2 Feb) “The Poetics of Darwin’s Voyage of the ‘Beagle.’” Department of English Postgraduate Seminar. University of Edinburgh. 1989 - (25 April) "Misreading South America.” Panel Discussion. Edinburgh’s First Multicultural Fair. 1988 - (5 May) “Hollywood Views of South America.” Christina Society. University of Edinburgh. 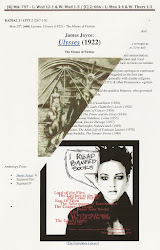 1987 - (17 Feb) "Mythologies of South America.” Ex Libris Society. Edinburgh University. 1986 - (19 June) “John Masefield’s South America.” Department of English Staff Seminar. Auckland University.